What Are the Benefits of Salt Scrubs? 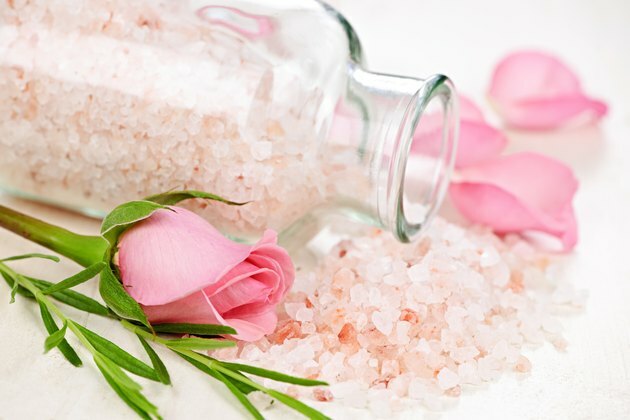 Sea salts and Epsom salts, or magnesium sulfate, both commonly used in the beauty industry, contain minerals that can help to enhance the skin. The magnesium in Epsom salts can reduce inflammation, while sulfates flush out toxins, according to the Epsom Salt Council. Sea salt, derived from evaporated seawater, is also chock full of minerals beneficial to the skin. When mixed with olive, almond or rosehip oil, salt can breathe new life into tired skin. Gently rubbing the skin in circular motions with a salt scrub removes dead skin cells in a process known as exfoliation. Dead skin cells harden with age. The longer they lie on the surface of the skin, the harder they get. This layer of skin will become thicker and thicker until it is finally removed. Layers of dead skin cells can make the skin look dry and flaky; exfoliation with a salt scrub reveals the moist, shiny skin hidden underneath. The abrasive action associated with salt scrubs invigorates the skin and helps to improve circulation. Improved circulation gives skin a natural glow. Scrubbing with salt also helps to remove bacteria from the skin and unclog pores. Salt has antiseptic qualities, and when applied to the skin it may help kill bacteria and reduce inflammation along with any itching and pain associated with bacterial-related skin disease. Exfoliating with a salt scrub not only removes dead skin cells and increases circulation, but it also encourages regeneration. Sloughing away dead skin cells actually promotes the growth of healthy new cells. This regeneration process tightens the skin, giving it a firmer and younger-looking appearance. Skin regeneration also reduces skin discoloration, evening out skin tone and improving texture. What Is Himalayan Salt Good For?